Spacious, luxurious, modern sport yacht with multiple sunning areas and a large sunpad on the front for relaxing. Choose your yacht rental duration and price below. Click to book and reserve for only $199 down. 2 hour evening cruises depart anytime between 5pm-7:30pm. The 50 ft Sea Ray Sundancer is the perfect blend of sport and luxury. She has 2 staterooms, 2 bathrooms, kitchen and lounge. Its interior cabin areas are all fully air-conditioned. 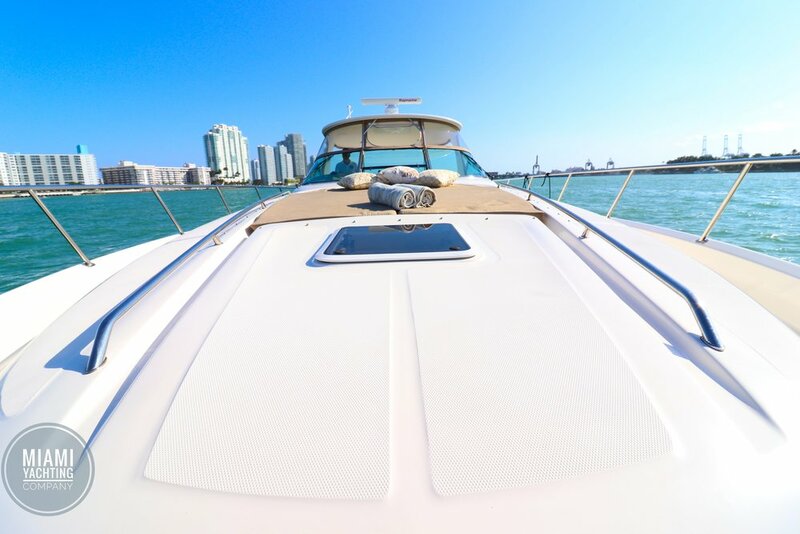 It’s large outdoor seating areas and sun pads are perfect to relax on while gliding through the warm waters of Miami.